Enjoy a scenic 30-minute drive along the peninsula to the Victoria Butterfly Gardens and the world famous Butchart Gardens - a Canadian National Historic Site. 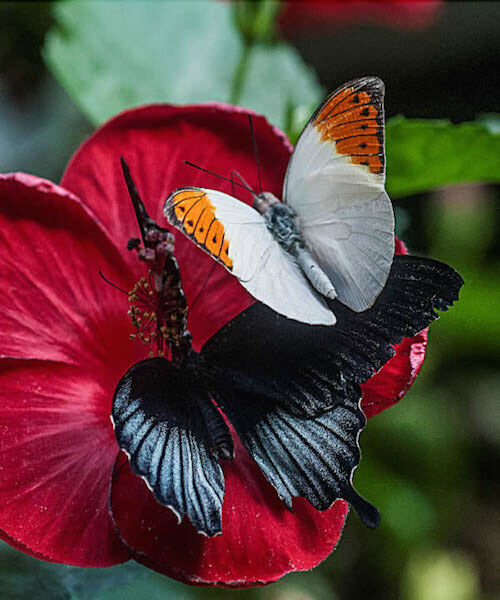 Our first stop is the Butterfly Gardens, a 12,000 square foot indoor tropical jungle where the flowers are always blooming and the butterflies are among the star attractions. The jungle is complete with thousands of exotic free-flying butterflies, pink flamingos and other tropical birds and fish. Enjoy the poison dart frog exhibit - but don't get too close! After your 45-minute visit to the Butterfly Gardens, you will make a 5-minute transfer to the Butchart Gardens. The Butchart Gardens - one of Victoria's most famous and popular attractions! Begun in 1904 as an effort to restore a worked-out quarry site, The Butchart Gardens has since been delighting visitors from all around the world. As you make your way around the gardens, you'll walk through intimate stone paths and streams lined with colorful arrays of flowers and trees. The gardens adjusts their floral displays to suit the season so it is just as spectacular in Spring and Fall as it is in Summer. This tour allows the flexibility of returning on any CVS Tours return schedule back to downtown Victoria. PLEASE NOTE: Tour is available from May 1 to September 30, 2015. Don't forget your camera. PLEASE NOTE: Tour is available from May 1 to September 30, 2015.